There are many advantages to making your baby's cereal; you have the opportunity to choose the healthiest unprocessed grains, there are no unpronouncable ingredients and you save a few dollars especially when making it organic. Not to mention the pride you will feel in knowing that you are giving your child the best food available! The first step is grounding the cereal to a sandy powder. 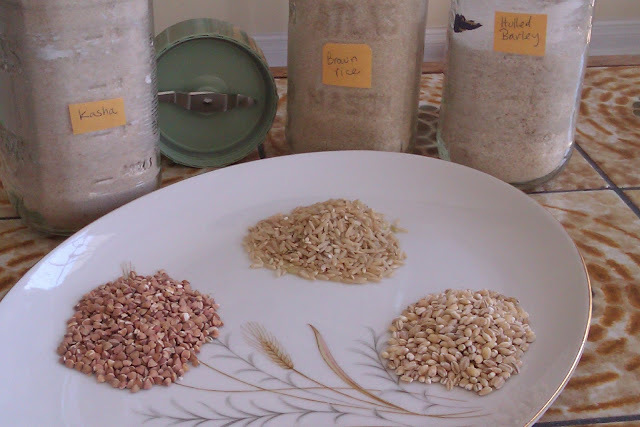 My photo above shows the grains in both forms. They can be economically purchased in bulk quantities. Ready? Using a food processor, blender or the milling blade in your Baby Bullet, ground either brown rice, kasha (roasted buckwheat) or hulled barley to a powder and store in an airtight container. I re-use glass jars. Note that hulled barley is less processed than pearl so contains more nutrients but you can use either form of the cereal. Add 1/4 cup of ground cereal to 1.5 cups boiling water, whisk constantly for 10 minutes and add water as needed, keeping the cereal at a low boil. Let cool and serve with vegetable, fruit, raw juice or the protein puree of your choice. Cooked baby cereal can be refrigerated for up to 48 hours or frozen in batches and should be fortified using breastmilk or commercial baby formula just prior to serving - not while it is cooking. I prefer not to have to cook cereal every day and since I feed my baby various types of cereal, including raw cereals, I only need to prepare cooked cereal once or twice per week. When I cook a batch, I freeze half and refrigerate the rest. For optimal smoothness, blend the cooked cereal with your puree just before serving. This is no trouble if you are used to blending partially raw meals on demand anyways! To be or not to be raw baby?